Left, subscale Goddard testbed; right, concept of final vehicle based on overall dimensions reported. American manned spacecraft. Flight tests begun 2006. 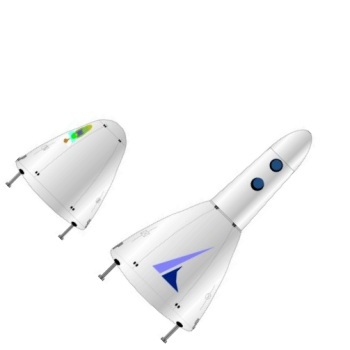 Vertical takeoff/vertical landing suborbital tourist spacecraft being developed by Blue Origin originally scheduled to begin commercial operation in 2010. Status: Operational 2006. First Launch: 2006-11-13. Last Launch: 2018-07-18. Number: 9 . Thrust: 1,020.00 kN (229,300 lbf). Gross mass: 75,000 kg (165,000 lb). Unfuelled mass: 20,569 kg (45,346 lb). Specific impulse: 260 s. Height: 15.00 m (49.00 ft). Diameter: 7.00 m (22.90 ft). Financed by an American billionaire, a prototype began flight tests from a private west Texas spaceport in November 2006. Blue Origin was founded and funded by billionaire Jeff Bezos, founder of amazon.com. In common with several of the serious commercial spaceflight endeavors, technical information on New Shepard was scant. Flights were being conducted from a private spaceport at the 165,000-acre Corn Ranch, 40 kilometers north of Van Horn, west Texas. The launch point was reportedly 8 kilometers west of Highway 54. The spaceport included a vehicle processing facility, a launch complex, vehicle landing and recovery areas, an astronaut training facility, lodging, and other support facilities. The launch pad would cover 3,000 square meters; the landing pad would be located 6.1 km north of it. Based on information given in FAA certification papers and local environmental briefings, New Shepard was similar to the DC-X VTOVL prototype flown by Douglas in the 1990's. However Blue Shepard consisted of two modules: a crew module for at least one pilot and three passengers, and a propulsion module. The overall vehicle was roughly conical. Propulsion would be by 90% hydrogen peroxide and RP-1 kerosene. The spacecraft was said to have a propellant load of 48,534 kg of hydrogen peroxide oxidizer and 5,897 kg of RP-1 kerosene fuel and a thrust of 1020 kN. The mission profile was said to include 110 seconds of powered flight with engine cutoff at 38 km altitude. New Shepard would coast upward to at least 100 km altitude, and then begin its fall back to earth. The total mission duration was said to be 10 minutes. The entire mission would be controlled autonomously by avionics housed in the propulsion module. Propellant retained for the landing maneuver would be 4,083 kg (3,629 kg hydrogen peroxide and 454 kg kerosene). Normally the crew cabin would remain attached and the normal landing mode would be a vertical rocket landing, with the engines igniting only a few dozen seconds before touchdown. In early flights or emergencies the crew cabin would separate from the propulsion module using solid rockets, and make its own landing under parachute. Initial launch, hover, and landing testing of the Goddard subscale prototype, up to 600 m altitude, and lasting up to a minute, began with the first flight on 13 November 2006. A maximum of ten flights were to be made with this craft, followed by around 50 tests of full-scale and incrementally-improved vehicles, up to 100 km altitude, between 2007 and 2009. Revenue service was expected to begin no earlier than 2010. In full service Blue Origin expected to make commercial weekly flights into space. No more than ten shipments of propulsion and / or crew modules were expected to be made from the assembly plant near Seattle, Washington, to the spaceport, between 2006 and 2010 - implying the total in-service fleet would be less than four spacecraft. Analysis of the available information indicates that the New Shepard's gross takeoff mass would be most likely about 75 metric tons at an average specific impulse of about 2560 seconds (range 71 to 78 metric tons for specific impulses of from 280 to 240 seconds). Crew Size: 4. Spacecraft delta v: 3,360 m/s (11,020 ft/sec). Family: Manned spacecraft, New Space Tourism, Suborbital, test vehicle. Country: USA. Spacecraft: New Shepard. Propellants: H2O2/Kerosene. Launch Sites: Blue Origin. Bibliography: 2. 2006 November 13 - . Launch Site: Blue Origin. Launch Vehicle: New Shepard. First test launch of New Shepard subscale prototype - . Nation: USA. Agency: Blue Origin. Class: Manned. Type: Manned rocketplane. Spacecraft: New Shepard. The test vehicle, dubbed Goddard, lifted off and landed vertically, and reached 90 m altitude. The launch, delayed twice for winds, came at the end of a three-day FAA-approved window. Video and pictures issued indicated that the test vehicle was a subscale (about 84%) version of the final manned vehicle; and that it used a hydrogen peroxide monopropellant rocket engines in place of the hydrogen peroxide/kerosene engines planned for the production vehicle. 2015 November 23 - . 17:21 GMT - . Launch Site: Blue Origin. Launch Vehicle: New Shepard. New Shepard CC - . Nation: USA. Apogee: 101 km (62 mi). Blue Origin's New Shepard vehicle carried its prototype crew capsule to 100.5 km altitude, the booster reaching 100.4 km. The booster was recovered in a controlled vertical rocket landing, the first such successful landing on the Earth's surface following an exoatmospheric flight. The crew capsule landed nearby on a parachute. 2016 January 22 - . Launch Site: Blue Origin. Launch Vehicle: New Shepard. New Shepard CC - . Nation: USA. Apogee: 101 km (62 mi). Blue Origin reflew the second NS propulsion module to 101.7 km and successfully landed it. The crew capsule separated near apogee and was recovered by parachute. It's not clear whether this was the same crew capsule as in earlier flights..
2016 April 2 - . 15:18 GMT - . Launch Site: Blue Origin. Launch Vehicle: New Shepard. New Shepard M4 - . Nation: USA. Apogee: 103 km (64 mi). Test mission. Impacted in West Texas..
2016 June 19 - . 14:36 GMT - . Launch Site: Blue Origin. Launch Vehicle: New Shepard. New Shepard CC - . Nation: USA. Apogee: 101 km (62 mi). Test mission. Impacted in West Texas..
2016 October 5 - . 15:36 GMT - . Launch Site: Blue Origin. Launch Vehicle: New Shepard. New Shepard - . Nation: USA. Apogee: 94 km (58 mi). Blue Origin flew the New Shepard rocket vehicle from the West Texas launch site to an apogee of 93.7 km and landed it nearby 7min29s after launch. On this mission the New Shepard crew capsule, which normally separates at apogee, instead fired its pusher abort motors 45 seconds after launch at an altitude of 4.9 km, reaching an apogee of 7.0 km and landing 4min16s after launch. Before launch it was expected that the in-flight abort separation of the capsule would destroy the booster rocket but in the event the rocket's flight did not appear to be affected. This was the 5th flight of New Shepard rocket vehicle 2, and possibly the 6th flight of the first Crew Capsule. 2017 December 12 - . 16:59 GMT - . Launch Site: West Texas. Launch Vehicle: New Shepard. New Shepard CC2 - . Nation: USA. Apogee: 99 km (61 mi). Test mission. Impacted West Texas..
2018 April 29 - . 17:06 GMT - . Launch Site: West Texas. Launch Vehicle: New Shepard. CC 2.0-1 - . Nation: USA. Apogee: 106 km (65 mi). Test mission. Impacted West Texas..
2018 July 18 - . 15:11 GMT - . Launch Site: West Texas. Launch Vehicle: New Shepard. New Shepard CC2 - . Nation: USA. Apogee: 119 km (73 mi). Abort test. Landed West Texas..